What’s with all the racquet? They say tennis is a “sport of a lifetime,” and it’s true. You can play from your earliest years to your latest. In fact, we have lessons and classes for anyone from 3 to 103! Better yet, very little equipment is required – just grab a racquet and a friend and head down to the J’s Joe & Byrna Funk Goodtime Tennis Courts at the Ron Zahler Tennis Center. 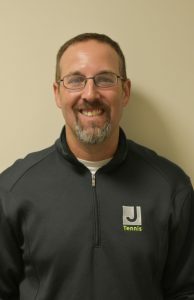 The J’s tennis staff is full of seasoned pros ready to help you improve your skills and fall in love with the sport. 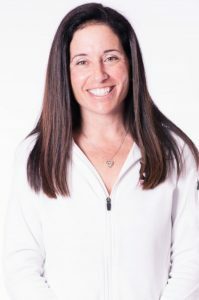 Our tennis director, Austin Holley, and our assistant directors, John Singer and Polo Cruz, help make sure your backhand is as good as your forward swing, while Rena Grubstein, manager of our Pro Shop, ensures you look your best in order to play your best. We can even restring and re-grip your racquet to get you quickly back on the court. If you have any questions, feel free to contact Austin Holley at aholley@jccdallas.org. This class is for beginner children who will play on a 36-ft. court. The basics are taught along with games designed for hand-eye coordination and maximum fun! Children will be picked up from the JCC Preschool or may be dropped off at the Pro Shop. Rackets provided if the child does not have one. This class is for beginner children who will play on a 36′ x 18′ court with a racquet of up to 23”. The class is designed for young players who are just getting started and for experienced players looking to move to Orange level. Red Balls are the softest felt or foam balls with a reduced bounce, which allow the children to work on mechanics. Drop-in price: for any Red Ball Class is $28 for members and $36 for non-members. This class is played on a 60′ x 21′ court with a racquet of up to 25″. Orange balls are designed for juniors to elongate their swing with correct form. The softer felt or foam ball has a reduced bounce and stays low so that it will stay in the strike zone longer. Beginner players will learn the proper form and mechanics, live rallies, and match play with strategy. Drop-in price: for any Orange Ball Class is $30 for Members and $38 for Non-members. This class is played on a full 78′ x 27′ court with a slight reduced bounce from the standard yellow tennis ball and a racquet of up to 27″. Green Balls are slightly stronger which allows players more time to set up and hit the ball. Instruction on form and strategy will be taught in this class with the goal to get the child ready for tournament play. Drop-in price: for any Green Ball Class is $30 for Members and $38 for Non-members. Our drills and clinics are a great way for you to stay in shape and sharpen your skills. We offer several adult days and times for every skill level. Call the Pro Shop to find out which one will be the best fit for you. For more information and to register, please contact us at 214-239-7154 or rgrubstein@jccdallas.org. 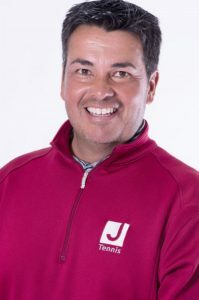 The J Tennis Professional Staff offers a variety of junior and adult lessons from beginners to championship levels. You can book private or group lessons 3-90 years of age. Lessons consist of stroke production, technical critiquing, as well as court positioning with the proper foot work. Please call the J Tennis Facility at 214-239-7154 to book your lessons. The J Tennis facility offers J Members and Non Members opportunities to participate in house singles and doubles leagues, Metro Teams, Ladies TCD Teams, TCD Mixed Doubles Teams, and TCD Love 50 Teams. The J Tennis Facility has 6 Woman’s and Men’s USTA teams. If you are interested in joining a Ladies 3.5 Team, or Men’s Team 3.5-5.0. please contact Austin Holley at AHolley@jccdallas.org. New Player: Has no or limited tennis experience and is still working primarily on getting the ball into play. Beginner Player: Needs on-court experience. Has stroke weaknesses but is familiar with basic positions for singles and doubles play. Beginner Player: Learning to judge where the ball is going although court coverage is weak. Can sustain a short rally of slow pace with other players of the same ability. Beginner-Intermediate Player: Fairly consistent when hitting medium-paced shots, but strokes lacks execution when trying for directional control, depth or power. Needs work on depth and variety. Intermediate Player: Has achieved improved stroke dependability with directional control on moderate shots, but still lacks depth and variety. Starting to exhibit more aggressive net play and has improved court coverage. Intermediate-Advanced Player: Has dependable strokes, including directional control and depth on both forehand and backhand sides plus the ability to use lobs, overheads, approach shots and volleys with some success. Rallies may be lost due to impatience. Advanced Player: Starting to master the use of power and spins; can handle pace, has sound footwork, can control depth of shots and is beginning to vary game plan according to opponents. Can hit first serves with power and accuracy and place the second serve. To enhance your game and to make sure you look great on the court, our Tennis Pro Shop carries the latest racquets, shoes and tennis apparel for adults and juniors. We also offer restringing and re-gripping services. The cost varies, depending on your preference for synthetic or natural gut strings. Just drop off your racquet at the Pro Shop and we’ll get you back in the game as quickly as possible. For questions about customizing, please contact Polo Cruz at 214-239-7154. If you just want to go it alone and practice your own technique, we have a great ball machine (with a remote control, no less!) that gives you the workout you need. Please call the Pro Shop to schedule a set-up. If you have any questions, please call Rena Grubstein, Pro Shop Manager, at 214-239-7154. *Tennis Pro Shop has the same schedule as Tennis Court hours. 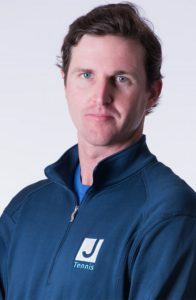 Austin is the Director of Tennis at the J (1993 - present). He attended Tyler Junior College and University of North Texas. 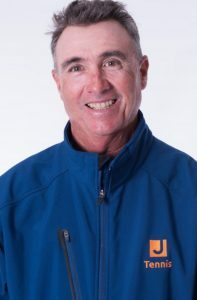 John has been USPTA-certified for 30 years. James has been a Teaching Pro at the J since 2014. 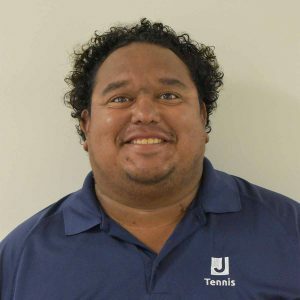 His tennis accomplishments include: 9 years Tennis Teaching Professional, USPTR-certified, and he played Futures Pro Tour Tennis Tournaments. 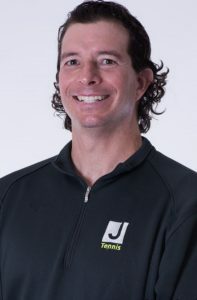 John is USPTA/PTR Certified and has been teaching tennis for 20 years. He is a Tennis Professional at the J (2012 - present).